Merk Insights - What Could Possibly Go Wrong? This time is different. Stocks will always go up. And pigs can fly. Given that pigs are highly intelligent, don’t bet against them. That said, investors might want to take at least the first two statements with a grain of salt. In the 1990s, stocks continued to rise relentlessly for years, even after then Fed Chair Greenspan warned of irrational exuberance in late 1996. Last decade, the rally in home prices continued as ever more people appeared convinced that home prices never fall. This time around, we are eight years into a bull market. As in those times, investors have all but given up betting against conventional wisdom. Much of that is because it has cost investors dearly to bet against the markets. In fact, it has been so costly to bet against the market that some advisors who have been cautious are no longer in business. And I’m not just talking about short sellers, but also many who have - in our view prudently - diversified beyond a traditional “60/40” stock/bond portfolio. We know of advisors who positioned their portfolios more aggressively not because they thought the markets were going higher, but because they were losing clients for underperforming the S&P 500. The investment industry has evolved to provide ever more index products, with lots of touting how active management is dead. If that were true, we wouldn’t have a plethora of index funds for many slices of the market as selecting anything but a market portfolio is the very definition of active management. Then again, when “everything” goes up, does it really matter what you buy, so long as investors buy something? So what is different? In the old days, we had banks and floor traders provide liquidity. Dodd Frank has significantly cut back the type of trading banks may engage in. And floor traders have been replaced by computers. Floor traders on the New York Stock Exchange used to have a duty to make orderly markets with the ability to slow down trading to match buyers and sellers. That philosophy lost out to the philosophy that speed is more important than price, meaning that if an investor wants to trade, let them trade instantaneously, even if the price needs to adjust sharply. - A so-called lead market maker gets incentivized to offer a tight spread for an ETF (the incentive comes from the exchange giving the market maker a rebate on the price, i.e. giving them a price advantage through actual cash; the rebate comes from the exchange fee investors are paying). - There’s a plethora of other market makers also providing liquidity, enabling what appear to be mostly efficient markets. These other market makers also get incentives from the exchange, albeit lower ones than the lead market maker. As a result, it creates a structure where all market makers can offload their risk to the lead market maker. This makes it comparatively easy for market makers to make markets in thousands of ETFs, as they don’t need to understand too well the ETF they are providing liquidity for; all they need to know is that they can offload their risk to the lead market maker. - This system works great until the lead market maker has a glitch and takes its systems offline. When that happens, other market makers see that the party that is supposed to be best informed (the lead market maker) is stepping away. Not surprisingly, everyone else also steps away, causing spreads to widen. - A flash crash can then happen if investors place large market orders just as liquidity providers are offline. To the extent that information is processed correctly, trading firms focused on ‘big data’ scanning the news flow automatically may well speed up how readily new information is absorbed in the market. As such, the rising influence of machines in the market may well contribute to the lower volatility we have seen. That said, we wonder how big that impact is. When ECB chief Draghi said, he’ll do “whatever it takes” to save the euro a few years ago, he put into plain English what had been happening for some time since the onset of the financial crisis: taking risk out of markets. A few weeks ago, he said in a press conference there’s no need to be concerned about upcoming events in the Eurozone because we can’t do anything about the outcome anyway; and if something bad were to develop for the markets, the ECB would take the appropriate action. Differently said: heads, I win; tails, you lose. More abstractly speaking, central banks have compressed risk premia through quantitative easing and their forward guidance. In our analysis, all else equal, lower volatility warrants higher valuations. That’s because in a classic valuation model where asset prices reflect the present value of discounted future cash flows. Lower volatility increases valuations because future cash flows are discounted at a lower rate. This warrants the question whether volatility will stay lower, permanently. I have my doubts. On the contrary, in my assessment the hallmark of any asset bubble is low volatility. Capital misallocations happen when risk is underpriced. When it is a central bank, be that the Fed, the ECB or another central bank causing the underpricing of risk, it doesn’t suddenly become rational. Sure, one can argue that it is a quixotic task to fight the Fed, but that doesn’t mean an asset bubble won’t be created and won’t burst. We believe one of the reasons the Fed has been so reluctant to raise interest rates is because of the “taper tantrums” the market has exhibited. Because we believe the economic recovery was driven by asset price reflation, the Fed has been hesitant to withdraw stimulus too early, to avoid deflationary forces taking over again. The Fed has been trying to engineer what we call a “cliff walk” trying to normalize interest rates without causing a shock to asset prices. Of late, the Fed has been emboldened: with a few speeches, the market delivered the Fed a rate hike on a silver platter, without equity markets having a fit. Indeed, some Fed officials have been all chirpy of late, talking about three to four interest rate hikes this year. Fed officials are acting as if they were at cocktail parties bragging about their great trade, pardon, rate decision. The reason I’m skeptical is because the folks at the Fed are so data dependent that they tend to fight yesterday’s war. For example, President Trump’s inability to pass healthcare legislation at this stage, and the implication that he might be less effective with other items of his agenda, may not appear on the minds of ivory tower academics more concerned about extrapolating data from non-farm payroll reports. By the way, as of this writing, the market is pricing in just under 2 and half rate hikes for the year, including the March rate hike (based on Fed Funds futures). Differently said, we believe the Fed may well be thinking that the crisis is behind us, that the time to normalize is now. This may well mean higher volatility and lower asset prices. So should you “get ready for the crash...”? Isn’t this alarmist? We don't think so. In fact, you may always want to be ready for a crash. You may want to hope for the best, but that’s not a strategy; you should always plan for the worst. As such, stress testing one’s portfolio may always be a prudent idea. That said, we do think that the odds of a more serious decline in asset prices have increased sharply given a combination of what we believe are high valuations; a period of low volatility that may be nearing its end; rising interest rates; all of this in the context of what we believe is an over-exposure to equities in both individual and institutional portfolios. So here I am cautioning that the Fed may drop its reluctance and become more assertive in raising rates. Isn’t that bad for the price of gold? It all depends on how one thinks this will play out. I happen to believe that a more assertive Fed will take it away from its path on the cliff walk. And once you take a step to the side when walking on a cliff, well, watch out below. That is, I don’t think the Fed can normalize rates even if they wanted to. I happen to think that a more assertive normalization attempt will cause equity prices to plunge. When equity prices plunge, investors may well think the glass is half empty, i.e. interpret any news on the economy or out of Washington to be bad for the markets. Confidence can evaporate rather quickly. The ivory tower club at the Fed will take note of deteriorating financial conditions and, well, not be able to execute the normalization of interest rate policy as underlying economic data increasingly start to disappoint. There are obviously many other scenarios as well, but the above is our baseline scenario for the time being (and subject to change at any moment). Note that gold has outperformed the S&P in the first quarter despite an interest rate hike. In our analysis, the price of gold has gone up in each bear market since the early 1970s, with the notable exception of the Volcker-induced bear market in the early 1980s where real interest rates were pushed to very high levels. We aren’t suggesting investors should dump their equities and buy gold. We mention gold because it is one of the “easiest” diversifiers; easy because gold dynamics are easier to understand than other ways to seek diversification for one’s portfolio in an era when most asset prices may be elevated. 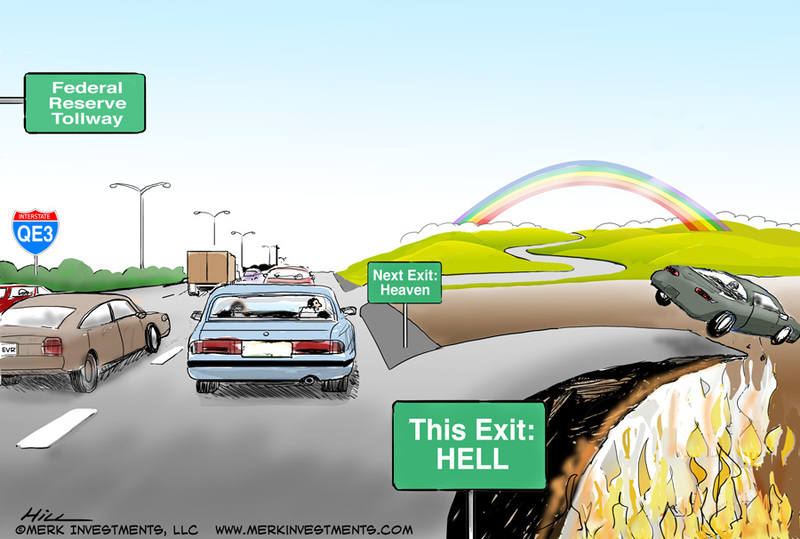 Easiest also doesn’t mean best, as the price of gold doesn’t always go up when equities go down. We shall continue the discussion. Please make sure you subscribe to our free Merk Insights, if you haven’t already done so, and follow me at twitter.com/AxelMerk. If you believe this analysis might be of value to your friends, please share it with them.